Some burning problems in combustion chemistry (R.W. Walker). Reactions of NHx species (J.L. Durant, Jr.) Recent advances in the kinetics of radiolytic processes (S.M. Pimblott, N.J.B. Green). Effects of low frequency electromagnetic fields on crystal growth from solutions (D.T. Beruto, M. Giordani). The kinetics of the hydrogen evolution reaction at nickel electrodes (J. Tamm, L. Tamm). Kinetics and mechanisms of silylene reactions: A prototype for gas-phase acid/base chemistry (R. Becerra, R. Walsh). This series of volumes aims to publish authoritative review articles on a wide range of exciting and contemporary topics in gas and condensed phase kinetics. Research in Chemical Kinetics complements the acclaimed series Comprehensive Chemical Kinetics, and is edited by the same team of professionals. 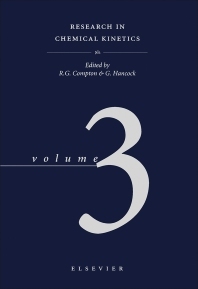 The reviews contained in this volume are concise, topical accounts of specific research written by acknowledged experts. The authors summarize their latest work and place it in a general context. Particular strengths of the volume are the quality of the contributions and their topicality, and the rapid publication realized.